1 A None No Power Seat 1 A is a Flagship First Class suite located at a bulkhead with a seat that transforms into lie-flat bed. The proximity to the lavatory, galley, and closets might be bothersome. 1 F None No Power Seat 1 F is a Flagship First Class suite located at a bulkhead with a seat that transforms into lie-flat bed. The proximity to the lavatory, galley, and closets might be bothersome. 10 A None No Power Seat 10 A is a Business Class seat that transforms into a lie-flat bed. 10 C None No Power Seat 10 C is a Business Class seat that transforms into a lie-flat bed. 10 D None No Power Seat 10 D is a Business Class seat that transforms into a lie-flat bed. 10 F None No Power Seat 10 F is a Business Class seat that transforms into a lie-flat bed. 11 A None No Power Seat 11 A is a standard Economy Class seat in the Main Cabin Extra section. The seat is located in an Exit Row, has exceptional legroom, and may be selected for an additional fee, however, a window is missing. Floor storage for personal effects is not available for use during takeoff and landing. The tray table and inflight entertainment monitor are installed in a fixed armrest, therefore, slightly reducing seat width. 11 B None No Power Seat 11 B is a standard Economy Class seat in the Main Cabin Extra section. The seat is located in an Exit Row, has exceptional legroom, and may be selected for an additional fee. Floor storage for personal effects is not available for use during takeoff and landing. The tray table and inflight entertainment monitor are installed in a fixed armrest, therefore, slightly reducing seat width. 11 C None No Power Seat 11 C is a standard Economy Class seat in the Main Cabin Extra section. The seat is located in an Exit Row, has exceptional legroom, and may be selected for an additional fee. Floor storage for personal effects is not available for use during takeoff and landing. The tray table and inflight entertainment monitor are installed in a fixed armrest, therefore, slightly reducing seat width. 11 D None No Power Seat 11 D is a standard Economy Class seat in the Main Cabin Extra section. The seat is located in an Exit Row, has exceptional legroom, and may be selected for an additional fee. A crew seat directly in front might seem awkward. Floor storage for personal effects is not available for use during takeoff and landing. The tray table and inflight entertainment monitor are installed in a fixed armrest, therefore, slightly reducing seat width. 11 E None No Power Seat 11 E is a standard Economy Class seat in the Main Cabin Extra section. The seat is located in an Exit Row, has exceptional legroom, and may be selected for an additional fee. Floor storage for personal effects is not available for use during takeoff and landing. The tray table and inflight entertainment monitor are installed in a fixed armrest, therefore, slightly reducing seat width. 11 F None No Power Seat 11 F is a standard Economy Class seat in the Main Cabin Extra section. The seat is located in an Exit Row, has exceptional legroom, and may be selected for an additional fee, however, a window is missing. Floor storage for personal effects is not available for use during takeoff and landing. The tray table and inflight entertainment monitor are installed in a fixed armrest, therefore, slightly reducing seat width. 12 D None No Power Seat 12 D is a standard Economy Class seat in the Main Cabin Extra section. The seat features additional legroom and may be selected for an additional fee. 12 E None No Power Seat 12 E is a standard Economy Class seat in the Main Cabin Extra section. The seat features additional legroom and may be selected for an additional fee. 12 F None No Power Seat 12 F is a standard Economy Class seat in the Main Cabin Extra section. The seat features additional legroom and may be selected for an additional fee. 13 F None No Power Seat 13 F is a standard Economy Class seat in the Main Cabin Extra section. The seat features additional legroom and may be selected for an additional fee. 14 F None No Power Seat 14 F is a standard Economy Class seat in the Main Cabin Extra section. The seat features additional legroom and may be selected for an additional fee. 15 A None No Power Seat 15 A is a standard Economy Class seat in the Main Cabin Extra section. The seat features additional legroom and may be selected for an additional fee. 15 B None No Power Seat 15 B is a standard Economy Class seat in the Main Cabin Extra section. The seat features additional legroom and may be selected for an additional fee. 15 C None No Power Seat 15 C is a standard Economy Class seat in the Main Cabin Extra section. The seat features additional legroom and may be selected for an additional fee. 15 D None No Power Seat 15 D is a standard Economy Class seat in the Main Cabin Extra section. The seat features additional legroom and may be selected for an additional fee. 15 E None No Power Seat 15 E is a standard Economy Class seat in the Main Cabin Extra section. The seat features additional legroom and may be selected for an additional fee. 15 F None No Power Seat 15 F is a standard Economy Class seat in the Main Cabin Extra section. The seat features additional legroom and may be selected for an additional fee. 16 A None No Power Seat 16 A is a standard Economy Class seat in the Main Cabin Extra section. The seat features additional legroom and may be selected for an additional fee. 16 B None No Power Seat 16 B is a standard Economy Class seat in the Main Cabin Extra section. The seat features additional legroom and may be selected for an additional fee. 16 C None No Power Seat 16 C is a standard Economy Class seat in the Main Cabin Extra section. The seat features additional legroom and may be selected for an additional fee. 16 D None No Power Seat 16 D is a standard Economy Class seat in the Main Cabin Extra section. The seat features additional legroom and may be selected for an additional fee. 16 E None No Power Seat 16 E is a standard Economy Class seat in the Main Cabin Extra section. The seat features additional legroom and may be selected for an additional fee. 16 F None No Power Seat 16 F is a standard Economy Class seat in the Main Cabin Extra section. The seat features additional legroom and may be selected for an additional fee. 2 A None No Power Seat 2 A is a Flagship First Class suite with a seat that transforms into lie-flat bed. 2 F None No Power Seat 2 F is a Flagship First Class suite with a seat that transforms into lie-flat bed. 21 D None No Power Seat 21 D is a standard Economy Class seat however, the proximity to the lavatories and galley may be bothersome. 22 A None No Power Seat 22 A is a standard Economy Class seat located in the last row of the aircraft. Seat back recline might be limited due to the bulkhead directly behind. The proximity to the galley and lavatory area might be bothersome. 22 B None No Power Seat 22 B is a standard Economy Class seat located in the last row of the aircraft. Seat back recline might be limited due to the bulkhead directly behind. The proximity to the galley and lavatory area might be bothersome. 22 C None No Power Seat 22 C is a standard Economy Class seat located in the last row of the aircraft. Seat back recline might be limited due to the bulkhead directly behind. The proximity to the galley and lavatory area might be bothersome. 22 D None No Power Seat 22 D is a standard Economy Class seat located in the last row of the aircraft. Seat back recline might be limited due to the bulkhead directly behind. The proximity to the galley and lavatory area might be bothersome. 22 E None No Power Seat 22 E is a standard Economy Class seat located in the last row of the aircraft. Seat back recline might be limited due to the bulkhead directly behind. The proximity to the galley and lavatory area might be bothersome. 22 F None No Power Seat 22 F is a standard Economy Class seat located in the last row of the aircraft. Seat back recline might be limited due to the bulkhead directly behind. The proximity to the galley and lavatory area might be bothersome. 3 A None No Power Seat 3 A is a Flagship First Class suite with a seat that transforms into lie-flat bed. 3 F None No Power Seat 3 F is a Flagship First Class suite with a seat that transforms into lie-flat bed. 4 A None No Power Seat 4 A is a Flagship First Class suite with a seat that transforms into lie-flat bed. 4 F None No Power Seat 4 F is a Flagship First Class suite with a seat that transforms into lie-flat bed. 5 A None No Power Seat 5 A is a Flagship First Class suite with a seat that transforms into lie-flat bed. 5 F None No Power Seat 5 F is a Flagship First Class suite with a seat that transforms into lie-flat bed. 6 A None No Power Seat 6 A is a Business Class seat that transforms into a lie-flat bed and is located at a bulkhead. The proximity to the galley and lavatory area might be bothersome. 6 C None No Power Seat 6 C is a Business Class seat that transforms into a lie-flat bed and is located at a bulkhead. The proximity to the galley and lavatory area might be bothersome. 6 D None No Power Seat 6 D is a Business Class seat that transforms into a lie-flat bed and is located at a bulkhead. The proximity to the galley and lavatory area might be bothersome. 6 F None No Power Seat 6 F is a Business Class seat that transforms into a lie-flat bed and is located at a bulkhead. The proximity to the galley and lavatory area might be bothersome. 7 A None No Power Seat 7 A is a Business Class seat that transforms into a lie-flat bed. 7 C None No Power Seat 7 C is a Business Class seat that transforms into a lie-flat bed. 7 D None No Power Seat 7 D is a Business Class seat that transforms into a lie-flat bed. 7 F None No Power Seat 7 F is a Business Class seat that transforms into a lie-flat bed. 8 A None No Power Seat 8 A is a Business Class seat that transforms into a lie-flat bed. Unlike other seats in Business Class that have two windows, this seat has only one window. 8 C None No Power Seat 8 C is a Business Class seat that transforms into a lie-flat bed. 8 D None No Power Seat 8 D is a Business Class seat that transforms into a lie-flat bed. 8 F None No Power Seat 8 F is a Business Class seat that transforms into a lie-flat bed. Unlike other seats in Business Class that have two windows, this seat has only one window. 9 A None No Power Seat 9 A is a Business Class seat that transforms into a lie-flat bed. 9 C None No Power Seat 9 C is a Business Class seat that transforms into a lie-flat bed. 9 D None No Power Seat 9 D is a Business Class seat that transforms into a lie-flat bed. 9 F None No Power Seat 9 F is a Business Class seat that transforms into a lie-flat bed. All Flagship First and Flagship Business Class seats feature a 15.4-inch HD-capable touchscreen monitor with a selection of hundreds of movies & TV programs, more than 350 audio selections, and up to 15 games. Every Main Cabin Extra and Main Cabin seatback has an 8.9-inch HD-capable touchscreen monitor with a variety of movies, TV programs, games, and audio selections available. All Flagship First and Flagship Business Class seats feature a 15.4-inch HD-capable touchscreen monitor with a selection of up to 75 movies, more than 150 TV programs, More than 350 audio selections, and up to 15 games. Every Main Cabin Extra and Main Cabin seatback has an 8.9-inch HD-capable touchscreen monitor with a variety of movies, TV programs, games, and audio selections available. Flagship First and Flagship Business passengers are offered premium dining. Main Cabin passengers are offered complimentary multi-course meals on nonstop transcontinental flights from New York JFK to Los Angeles and San Francisco. Non-alcoholic beverages are complimentary on all flights. Beer, wine, and a variety of spirits are complimentary in Flagship First, Flagship Business, and Main Cabin Extra. They may be purchased in the Main Cabin. The American Airlines Airbus A321 Transcontinental (32B) seats 102 passengers and is primarily used on routes from New York to the West Coast. This next-generation aircraft features the Flagship First Class cabin with 10 Open Suites with fully lie-flat seats in a 1-1 configuration giving every seat direct aisle access. The Flagship Business Class cabin has 20 fully lie-flat seats, designed by BE Aerospace, in a 2-2 configuration. In the Main Cabin Economy Class, the seats are designed by Recaro and arranged in a 3-3 configuration. The option to enjoy more legroom is available with 36 standard Main Cabin Extra seats and the aircraft also offers 36 standard Main Cabin seats. All window and aisle seats on this aircraft may have restricted storage space and legroom due to the position of an entertainment equipment box. Row 6 in American business class has shorter leg room than the other rows. There is reduced space in the foot well. I think this is the best seat in business class because (based on my flight) the meal service (which was rather slow) goes from the front to the back, so this seat gets served relatively soon; however it's also not right up against the sounds & lights from the gallery / lavatory. Flew from JFK->LAX. Even though it's a domestic flight this seat comes with Flagship lounge access and it's a nice lounge. On board I got the European cold breakfast and thought it was fantastic. The seats and blanket were more comfortable than I expected and the window seat allowed me to snooze undisturbed in my little flat cocoon for the majority of the flight. The lie flat seats are very comfortable in Business, but I had a not so great meal on this flight - beef, which was either over-cooked or a less than prime cut. The starter snack of mixed nuts was a bit stale/ lacking in flavor. Also the video setup/process is awkward. I wanted to watch a film at the start of the flight, but the crew didn't pass out the BOSE headsets immediately. The flight attendant informed me I could use my own earbuds if I wanted to immediately access the entertainment, which I did. Further, the area to plug in is in a dark little cubbyhole at the rear of your seat. I saw a couple using their Iphone's flashlight to figure out where to plug in. My seatmate grumbled that American wants to ensure that you don't steal the Bose headsets, given its awkwardly configured plug. You should note that all of the row 6 seats, especially C and D do not go as far back in terms of room as other business class seats. When we booked this flight (paying $1800 for Business/First seats, we were led to believe we would be in layflat seats but when we entered the plane there were only 12 first class seats that were so ordinary and cramped together, they were nowhere near as good as Premium economy on a 777. Basic economy has so little legroom that your your face is too close to the video screen in the seat back in front. Also, the front of this aircraft A321) was a good 10 degrees warmer than the back. When I asked the flight attendants (sitting in the back galley) if they could adjust it, they just looked at me blankly and said its the aircraft - they hate going up front too. Good legroom, terrible width, and an extremely uncomfortable seat overall. The width is actually quite shocking and the recline was completely insufficient. I found it more comfortable sitting upfront that using the recline. I'd recommend sitting in a different seat within Main Cabin Extra. 11f (and a) are not bad seats! At minimum they are mixed. The only downside is the missing window but 11f has about 6' of unobstructed legroom and 11a has about 3'. I would consider these good seats and get them every time. The missing window is actually better for sleeping because it is less awkward to lean against. For a red-eye, the Main Cabin Extra seats are the only viable Economy option. The knee crunchers in row 17 and up are impossible seats for overnight sleeping. In row 13, at least, both the center and window seats have utility boxes that reduce legroom so stick to the aisle if you want a full, under-seat space for your legs. Terrible flight, actually excruciating. I've had two back surgeries, and can't sit up straight. I always book premium coach seats so I get more recline. But this flight had only about two inches of recline. And it seems to be impossible to find out the amount of recline in advance. After 45 years, it looks like no more American for me. This seat has fantstic legroom though there is a crew seat across that was occupied during takeoff and landing. However, 11D was several (at least 2 and maybe 3 inches narrower than 11E and 11F. Would not recommend sitting here if you have a choice. Very uncomfortable. 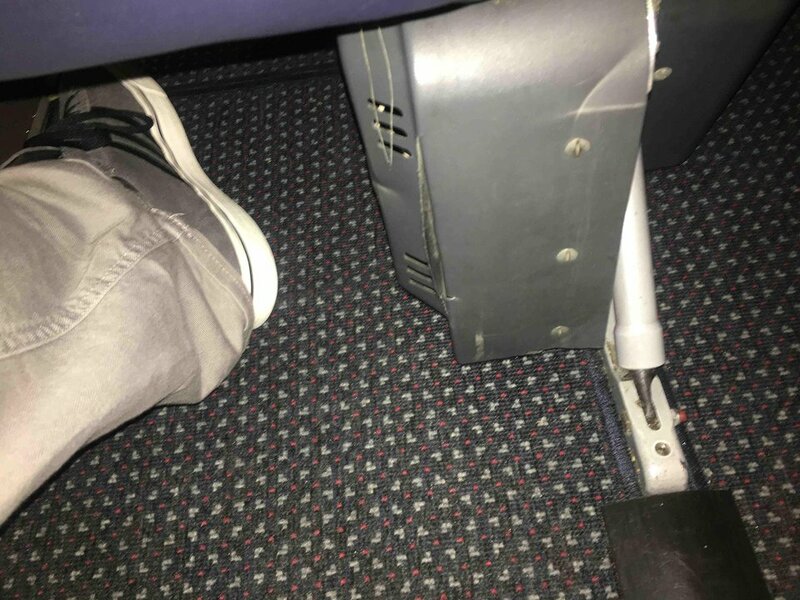 Also, the entertainment monitor is easy to tip over and when the occupant of 11F came back from a trip to the restroom he nudged the monitor sending it crashing into my leg. There needs to be a lock in the upright position to prevent this from happening. I dont believe this is a standard seat. I think width is reduced and right arm rest is lower than left. This is not a desirable seat. Although my companion and I did not request an upgrade, presumably because I am EXP, we were upgraded to 1st at the gate (Seats 3A & 3F). I usually fly J on AA's transcon routes, and the F seat and the IFE system felt exactly like those in J, with the exception that you have a lot more (not-so-usable) storage space in F. From what I could tell from the menus, the food offering, too, was pretty much identical. I was disappointed that I was unable to readily communicate with my companion because of the physical separation in F, and we would have strongly preferred to remain in J. All in all, unless you are traveling alone and don't want anybody near you, I don't see a reason to choose F over J on this plane. I fly a lot so Im frequently in First, This a/c in First, it absolutely the WORST. All seats in First are on an odd angle, No chance of relaxing on take off or landing to see out the window, its just not possible. Restricted Movement in General, Main cabin extra is must Nicer. I now avoid the 321 AT ALL COST! I've flown this plane multiple times in both first and business class. Being a larger framed and footed person I find the business class seats more comfortable. First class comes with many hard cabinet surfaces which restrict movement and comfort. I found it very hard to lay down and be comfortable. This is a great seat, tech is very nice, comfortable, and very roomy. Plane boards at the very front. I had "Dine & Rest" so only water bottle pre-flight but Grilled Lobster and Cheese sandwich meal was nice. Kitchen can be a little loud, but not too bad. Did LAX-JFK 9:00pm-5:30am. I was actually in the pod next to Heidi Klum, which was sweet. She was traveling to film America's Got Talent in NYC! I love the Flagship International Lounge access this provides, especially if you are using a connection you get to use it again (LAX and JFK for me!). Saw James Corden at JFK's. Too cool. This is regular economy being sold as premium. 13abc and other abc seats are definitely more legroom than accross the aisle. Man sitting next to me in 13e has regular economy ticket. Ours has priority on it but the seat is not priority/ premium economy. Stewardess says they are kust lined up differently. This is correct. There are more rows on cde than on abc. This is a scam! As context, I fly only 50,000 - 70,000 miles each year, but it is usually 3-4 lax to lhr trips combined with some x-country flights (lax - jfk, lax to iad). For the international flights I always fly on the 777, which has a somewhat similar configuration to the A321. Although the actual seat in business class is similar in the A321 and the 777, the configuration in the 777 gives each business class seat aisle access without disturbing any other passengers. I have flown in this configuration several times and think it is the best long-haul domestic offering of the major airlines. I was fortunate on my flight that the IFE in the adjacent seat was not working so they did not seat anyone in that seat allowing me to get up and down as I pleased without disturbing anyone. As context, I fly only 50,000 - 70,000 miles each year, but it is usually 3-4 lax to lhr trips combined with some x-country flights (lax - jfk, lax to iad). For the international flights I always fly on the 777, which has a somewhat similar configuration to the A321. Although the actual seat in business class is similar in the A321 and the 777, the configuration in the 777 gives each business class seat aisle access without disturbing any other passengers. Had to book late on a lax - jfk red-eye so my upgrade request was put in really late; however, it would not have mattered as the flight was packed and none of the 18 people on the upgrade list cleared. I have only platinum status and I am sure many on the list that did not clear were executive platinum. With that as context I am reviewing seat 11b. I do not have to pay for the premium seats and at the time of booking had selected 14D, which is an aisle seat in MCE. I decided to change seats to 11b even though it is a middle seat because it is a bulkhead seat with ample leg room. The leg room is substantial, but the width is more than slightly reduced by the tray in the armrest. The middle and aisle seats in this row have both armrests with trays and it seemed like the width was almost a full inch less. The flight was brutal with very little sleep. One small consolation is that the armrests go all the way to the seat, which was crucial for me on this flight as the passengers on my right and left were enormous. Had the armrest been standard they would have been overflowing into my seat. Did not stop the guy in the window seat from farting all night with some of the worst smells I have ever encountered. Fortunately the flight home the next night was pretty empty and my upgrade cleared early. The IFE for the business class seat next to me was broken so no one was seated there so extra bonus for the pain from this flight. C'mon, row 11 is by far the best place in the main cabin (B & E being slightly worse because they're middle seats). Why? The incredible legroom! Who cares about no big window, or any other nit-picks mentioned here, they're all trumped by that first-class legroom. Excellent seat. Lots of legroom. AA provides blankets on this service. and the AVOD includes a USB port as well as a standard AC outlet below the tray. It took me awhile to find it but look for the green light. I sat in seat 8a on the way there and seat 3f on the way back. Both were very good. if you are traveling with somebody I would highly suggest business over first. Unless you need a lot more space its really not worth the updrade. Had i sat next to someone horrible maybe i'd feel differently as you are close together but certainly far enough. Even alone I would book business unless they were very close in price. Also the ice cream was amazing. To say "proximity to galley and lavatory may be bothersome" is a bit of an understatement when it comes to a redeye. The cabin crew did not stop talking, and the light was really bothersome. This is true for both seats, but especially 6D. Probably the other side too. I think that AA has the nicest seat in the transcon market. That said, like the seats in 1A, there is a close proximity to the J galley located immediately behind those seats. Since the seats angle forward and towards the windows, light is NOT an issue, just loud noises from the galley. If you have a particularly robust Flight Attendant, you can hear slamming and feel banging in the galley during service. Seat 5A on the AA A321 transcon is a great hard product seat, but two issues make this more of a "yellow" seat to avoid in first class. First, it's connected to the wall behind it and flight attendants throughout my transcon redeye slammed shut a storage compartment waking me up almost 5 minutes after falling asleep. Happened almost every hour and was really annoying. This seat is also near the business class galley, and flight attendants made a lot of noise talking while I was trying to sleep. If you have a choice in first class, avoid 5A and pick a different seat. This plane is awesomw. The configuration is perfect. I loved flying to NYC on it. So comfortable and private. The amenities are so passenger friendly. I am not a good passenger and not once was I scared. The service was outstanding as were the pilots. Even when we had some turbulence the pilot managed to circumvent it. Here's to American Airlines! ???? Awesome seat, and awesome service. The Flagship experience is truly something else! This is a standard business class seat, but it is missing a window (seat only has one window; all other seats in biz have 2). This seems to be because of the way the plane is configured/built  there is a blank space of wall where there should be a window. AWFUL FLIGHT. I flew from JFK to LAX, 6 hour flight. Reclined about 2.5", seat cushion felt like a blanket over a cardboard box. Legroom was severely compromised when the seat infront of you reclined. Also, there was this one fligjt attendant THAT WOULD NOT LEAVE ME ALONE! I asked her why, and she said "you look cool." seriously (I am 6' 2" with generously sized biceps [and muscles in general])? Man, the return flight on Jetblue A321 in seat 19a was SOOOOOO much better! American's A321's are good planes. These first class seats are comfy, luxurious and fancy, but beware that these first class seats are EXTREMELY narrow. Red eye flight JFK to LAX, tried to sleep, but I couldn't really fit (I am 6, 3" and in fantastic shape with big biceps)! The service wasn't too good. Jetblue MINT flight on return was much better; cheaper, nicer FA's, an IFE that worked and an EXCELLENT seat. Ifnyou are flying transcon, take the MINT. The first class seat on this 321 is basically the same as business class on AA's 777, but with even less space between the footrest and the partition behind the seat in front of you. That space is so restricted that I caught my shoe in it while initially taking my seat, twisting my ankle. First class on AA's 321 is not at all comparable to the very spacious accommodations on the 777. Otherwise, the food and service on this flight were exemplary. Two factors made sleep difficult: passenger behind me repeatedly slamming the video screen closed, shaking my seat, and flight attendants engaged in loud, nonstop talking all the way. Had the chance to sit in 10A on JFK-LAX. First time on the AA A321 Transcon. Some key thoughts: -Going westbound and fighting headwinds,it's sold 6-hour flight so the extra room is worth it. The seat does indeed lie flat. The pillows are average, and the blanket is well-above average. The complimentary Bose noise canceling headphones are dynamite and work fine. -This is a full lie-flat seat. It's business class, but feels much like an int'l first-class seat for sure. -We received options of champaign, OJ, or water before takeoff, plus a menu. Three options were a cheese/fruit plate, Chicken Sliders, or Crab cakes. Hot rolls were included and replaced when needed. Ice cream was included as well. 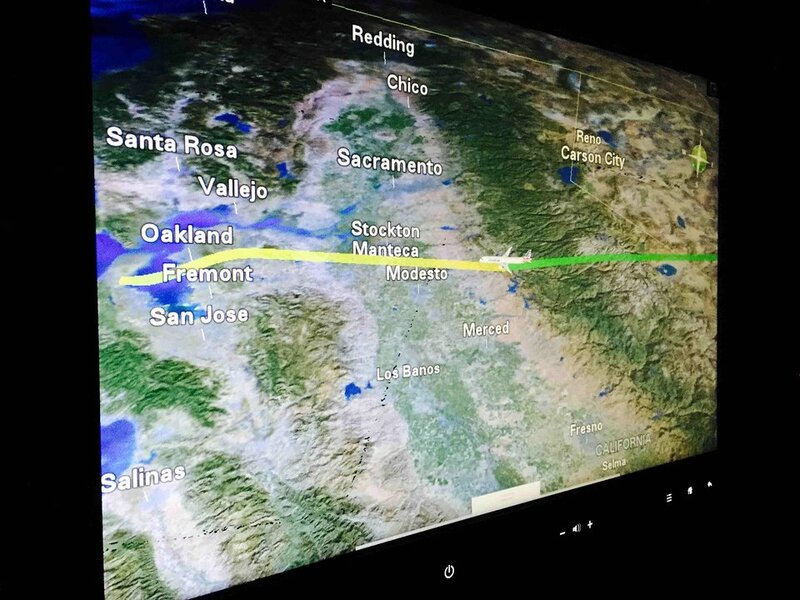 -Screen is very large, though takes a while to learn how to use, but terrific option of movies, music, HBO, maps, in-flight info with multi-views. -We had 2 FA's for the business section and it really felt like a private cabin. Lots of drinks and snacks. -I'd give an A+ to the seat. For a flight of 6+ hours, it's worth it. (I'm 6-1, 185) so a bit above average, but you can lay on your side...privacy from other person, and nice ottoman area for your feet. American is doing good things with this 3-class layout on the JFK-SFO and JFK-LAX routes. It was a full plane, but didn't feel like it whatsoever. I've flown the LAX/JFK route several times and have a different opinion of this seat. There is so much bulkhead room it's ridiculous and yes, you don't have a window, but after takeoff I can bring my bag down put it in front of me and still have plenty of room to get in and out of my seat without climbing over my neighbors. As a result, I can get more work done in this seat than anywhere else in the main cabin. I fly this AA transcontinental configuration every two weeks between JFK-LAX. I would never chose row 11 unless I had a broken leg in a full cast! You must stow your bag for takeoff and landing and there is no window. The only saving grace for the horrid middle seats in row 11 is that you can get up to go to the bathroom without waking the person in the aisle. If you are tall you must get main cabin extra; I would pick an isle in rows 12 through 16. (I believe these seats should be marked green on the seat map). Wifi is outrageously expensive. In the main cabin, there are no free movies, only two channels of junk. Board last call to see who may be sitting in first class. I traveled on 6/22/15 from LAX to JFK. This flight runs late a lot of times. I was a little nervous as I had an international connection out of JFK. This day things went OK. Service was excellent. I'll be back but next time I am getting an earlier flight. I flew first from LAX to JFK in seat 4A on 6/22/15. Service was fantastic and the seat was great. I really recommend the first class. I thought this plane was great. Flew SFO to JFK for the red-eye flight. I think it's the best domestic coast to coast service available today outside of a private jet. The video screen is huge and picture is sharp, with great map function. These are same business class seats used on international flights by some airlines and are quite comfy. Food and service were decent, and I enjoyed the Prosecco. There was no noise problem from galley or bathroom, as the seat map indicates may be a concern. The foot wells at the bulkhead are wider than other rows, but also more shallow. Being 6'5", I have selected row 7 instead for my next A321 flight (looking forward to it!). The coach Recaro seats have so many ergonomic flaws from tray table height to tray table hinges to large equipment boxes under seats to seat back screens that dont tilt to power outlet placed at yoiyr knee cap to headrests that dont stay up to many more. Recaro cannot spell Ergonomic !!! Idiots. I have used this plane twice on "red eye" flights from SFO to JFK. The privacy and flat bed comfort of the A321 in first class is unequalled on this route. I awoke from a solid sleep and appreciate this upgrade by AA. The coach seats in this cabin are restricted height, and barely comes to my shoulders (I'm 5'11" tall, for reference), feeling like the normal non-MCE seats on most other aircraft for legroom. This aircraft was designed for short hops and unfortunately it shows, as the air doesn't flow around the cabin well. AA is offering the best available first class transcon product today. All aisle access. Intimate 10 seat cabin. Very comfortable flat bed. Food is unremarkable. Service good for a legacy carrier. The best available product out there. JetBlue's suites on transcon flights are comparable but the cabin feels more cramped and less special. AA has a lav for first class section that seems to really be used just by the 10 pax in the F cabin. Chatter from FAs audible in row 2. Not a huge deal but a bit bothersome. I would strongly recommend avoiding row 1 because of that. I really enjoyed this newest aircraft in American's fleet. The first class seat is extremely comfortable and spacious. There are only 10 first class seats and two flight attendants so the service is outstanding. 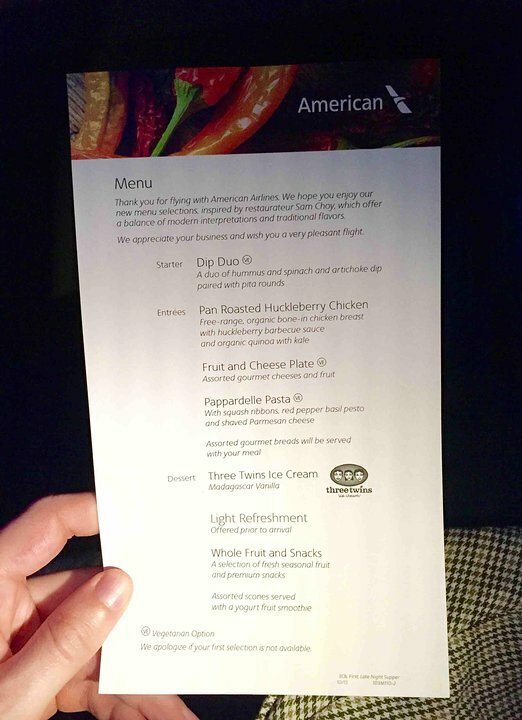 The food is not what I would expect from American which used to realy have fabulous First Class meals such as beef and seafood. Neither are offered anymore and I did ask the flight attendant about that. She indicated that the new president, Doug Parker has cut down on the menu selections. The inflight entertainment is fabulous. The give you a Bose Noise Cancelling headphone too! It was a very good experience but the food wasn't all that great. The warmed nuts with my drink was good and the ice cream sundae was great. I flew business from SFO to JFK, then first JFK to SFO. First is marginally more private, but not worth the difference in price. The first seat is only a little bit wider than the business seat. They use the same bedding. Service was adequate at best (typical USA domestic service), and the food was forgettable. Business class on the 321T is definitely a better value for the money (or miles). I have to say the seat is an imporvement from previous seats and is a true flat bed seat. However, it's still based on the rather dated 'Window or aisle" configuration. Only the "first Class" on this plane has the new Business class seats (used on their 777) with aisle access on every seat. Food was alright but the wine list was a basic sparkling (not actual champagne), red or white. And the only red wine they had available ran out before the main course! There is also no amenity kit offered either. In other words, if you need a real business class experience, you will have to book a First Class seat on this plane. Overall this product that is heralded by AA as a breakthrough is pretyy underwhelming and the fact it's a one-aisle plane does not help either. The arrangement of the business cabin is very efficient and pleasing. It is a fine balance of privacy for the solo traveller and proximity for couples travelling together. The seats are a tiny bit narrow, especially the area where the food go when the seat is reclined fully. The seat is still somewhat lumpy in the fully flat position. The duvet and pillow are quite nice and add to the comfort. I was able to sleep quite comfortably for 2-3 hours. The cabin was kept quite dark for comfort. Food and service was very good, not spectacular. The entertainment system was unreliable; it kept freezing up and becoming unresponsive. Bose headphones were a nice touch, but useless most of the flight. Wifi was available but also very sporadic and weak. (and EXPENSIVE). The ground people, especially in the Admirals Lounge are EXCEPTIONAl: helpful, efficient, pleasant. Business class is likely a better value for the money than first. This is a very comfortable seat. The privacy is very nice. Compared to my general experience of US domestic business class I was very impressed, it's comfortable (I'm not especially tall but can't see it would be a problem if you were). I slept as well as is possible on a flight. Entertainment system was excellent. Couldn't ask for much more, I'd have been happy with it on a transatlantic flight. Only complaint would be the cabin was a shade on the warm side. Not sure why people would complain about the new power outlet placement -- having the power over your shoulder gives a nice little shelf for devices as they charge and means you don't have to thread the cord from your laptop around the legrest or to the seatback pocket and have it pop out every time you change the recline or get out of your seat. I give this plane a B. The seats are efficiently designed given their shape with the magazine pouch up high and the sliding recline mechanism. However, the 5 hour flight from SFO to JFK got uncomfortable with the floor-level box for the entertainment system, especially with my large bag I put under the seat. The air was a bit stagnant for part of the flight, and as far as the TV goes, I'm glad that it was on-demand and the GPS system is amazing, but it should have a remote and there were no feature movies except for Disney. While the personal screens are a plus compared to the 767s, I prefer the 2-3-2 seating. The rest of my family went in Main Cabin Extra, which has a 38" pitch but I opted out because it would've meant a wing view. And it wasn't as comfortable as on the 737 to lean on the wall. Most unpleasant flight I ever endured. Took the JFK - LAX in the A321 and the coach configuration is not fit to transport human beings in any way, shape, or form. No legroom whatsoever, unbelievably narrow. I'll never fly American again. That's a promise. For a $1200 round trip, the A321 is easily the worst plane ever. Excellent plane except for the ridiculous placement of the power and audio outlets behind the seat. I flew from JFK to SFO and the flight was fun. There were touchscreens on the plane. I was asleep for most of the flight. It wasn't that bumpy, and the seats reclined enough.I enjoyed the flight. LAX to JFK red eye on A321. Seated in First Class seat 5F. I'm am 6'4" and the new first class cubicle is a tight fit. In full lie-flat position my lower half was restricted. The other features are very nice (i.e. monitor, privacy, AC outlet/USB Charger, etc.) but not ideal for sleeping if you are tall. Unless lie-flat is very important to you, it's only a slight improvement over 767. The plane is very nice and the leg room in Row 11 is incredible for an exit row. Only complaint is the personal TV which only has TV shows. There no movies available at this time. Flight attendant told me the movies were available from January to May but they have stopped them. No movie is even played on the general monitors. Again, nice plane, but I was disappointed with the video system on the plane. Huge improvement over the previous transcon 767 seat. Personal TV was great, and MCE offers a lot of extra legroom (I'm nearly 6 feet). Very comfortable flight. I'd do it again for sure. A great way to begin our long international trip was the flight from LAX to JFK on the Airbus A321. Although the 777 flight home from Heathrow to DFW was very comfortable, the Airbus A321 is on my wish list for every long flight. Lav and galley are a long way forward of the seats, and there was no disturbance at all. Two of us were in 1A and 1F, and agreed that this is by far the best transcon F in the marketplace. This plane was a delight after an 11 hr overnight flight on a 777 & was outstanding even without that comparison. Seats were truly horizonal-flat,sufficiently padded & very comfortable. Ambient lighting was subtle & relaxing. Aisle seats were angled away from the aisle & gave an unusual feeling of privacy. The food was especially good. If you thought it was difficult to plug into the DC / AC outlets in other aircraft, this is a whole new challenge. In business class, they are behind the seat along with the audio and USB outlets. You have to get out of your seat and its not lit well, so I had to use a flashlight to get all my electronics connected. The lay flat seats are easier to sleep in than the angle flat seats in the 767 and the personal large monitor and selections are a nice improvement. A MAJOR improvement over the old AA 767 F class. Seat is private and comfortable. Easy access to power, headphone jacks and screen. Main Cabin Extra gave more leg room, but the seat itself is narrow. This aircraft would be comfortable with 3+2 seating, but 3+3 is cramped. The seat reclines adequately, but its shape and thinner padding made for one of the most uncomfortable coach seats I have ever experienced. The basket is miniscule: it holds next to nothing. A big disappointment after all the hype. 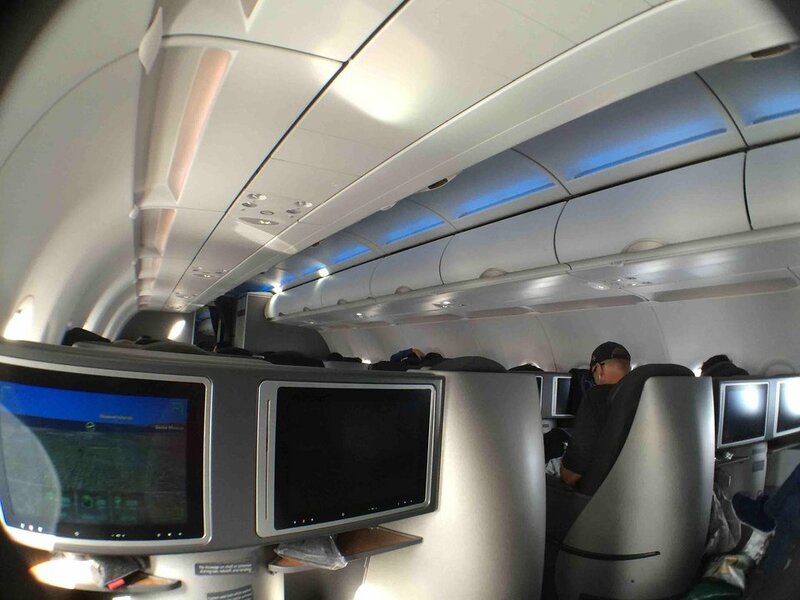 I've flown on American's new transcon Airbus 321 service. I've been in business class (seat 10F), it was a good experience, the new business class is much better than American's previous business class from LAX to JFK. Thumbs up! The Main Cabin Extra seats are problematic. Legroom is fine, but the PTV sticks out so much from the seatback that when the person in front of you reclines, there's almost no room to open a small laptop. Worse, if you do open it, the top of a 13" laptop lines up perfectly with the very touch-sensitive buttons that control the overhead light and call the flight attendant- making it a light show. An extra inch would do the trick here, but alas, the bulkhead is your only choice if you want to get work done on this airplane (the regular Main Cabin seats are horrifically close together, forget about a laptop). Proximity to lav and galley not really an issue. Only 10 seats in cabin and seat is slightly angled away from aisle. Best F domestic seat presently. HUGE product improvement over the 762 F offering. Now better than UA PS. DL and CO not even in the running. The main cabin extra seats are really a joke. I felt like I was sitting in regular economy. The person in front of my reclined and I could not move and if I did, it rattled the seat that was reclined. There is virtually no seat pocket so anything you want to put in there (headphones, snack, paperwork) just does not fit. Major disappointment for someone who travels frequently between JFK and LAX. FYI - Platinum status on American. American Airlines flies 1 versions of Airbus A321.